AURORA, Colo. - A court clerk's error led to a Colorado man's release from prison in 2008 - 90 years too soon. Authorities did not discover the mistake until January and immediately sent Rene Lima-Marin him back to prison to serve the rest of his 98-year sentence for armed robbery. But now, Marin's family is fighting for his release, arguing his clean life after eight years behind bars shows he has been punished enough. It had been nearly six years since he left prison, when, in January 2014, a team of police officers led Marin her away in handcuffs. His wife told her two young sons their father had to go to work,as he really was returning to prison. Lima-Marin's case comes to light as other clerical errors have let criminals evade prison time. In Missouri, a judge this week freed a convicted robber who didn't report to prison for 13 years - despite initially trying to do so - because of a clerical mistake. A Los Angeles murder suspect who was accidentally freed last year due to a clerk's error was captured on Thursday in Mexico. And in Colorado, an inmate mistakenly released four years early due to a similar mistake killed the state's corrections chief at his front door last year. That prompted Gov. John Hickenlooper to order an audit of thousands of inmates' records to ensure they are serving the correct sentences. Lima-Marin wasn't part of the audit because it focused on other kinds of felonies, corrections department spokeswoman Adrienne Jacobson said. It was in 2000 that Lima-Marin and another man were convicted after robbing two Aurora video stores when Lima-Marin was 20. In one robbery, they ordered employees into a back room at gunpoint, and a worker was ordered to the floor as they demanded money from a safe. A judge sentenced Lima-Marin to serve consecutive sentences on eight convictions, for a total of 98 years. But a court clerk mistakenly wrote in his file that the sentences were to run at the same time. Corrections officials depend on that file to determine how much time an inmate should serve. As a result, he was released on parole in 2008 after serving just eight years. Lima-Marin set about building his life - while, prosecutors say, he was fully aware of the clerical error and never notified authorities. Now 35, he started selling coupon books door-to-door, and more recently became skilled at cutting and installing windows. He reconnected with his former girlfriend, Jasmine Lima-Marin, and they married in July in a ceremony that also celebrated his completion of five years of parole. He was active in church and helped coach soccer. 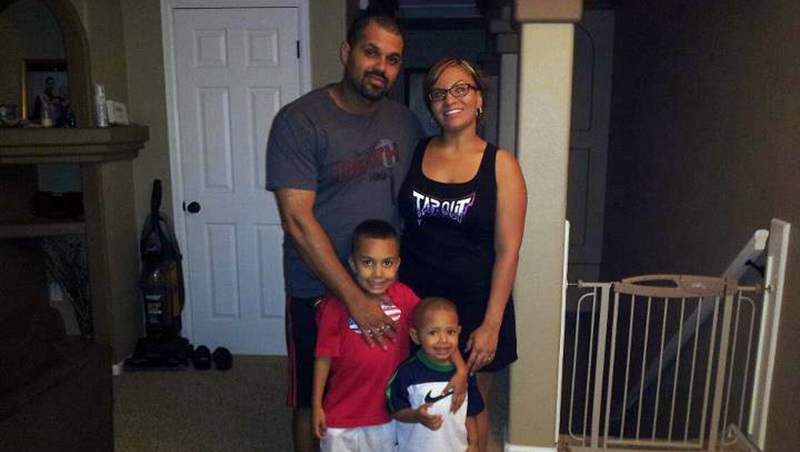 Lima-Marin helped Jasmine raise her 7-year-old son, Justus. Soon, they had another boy, Josiah, who is now 4. Lima-Marin was back in prison for his birthday party. "That was his life, raising his kids and being a husband," Jasmine said. "He definitely was not the same person that he was when he went in to prison." Lima-Marin's co-defendant, Michael Clifton, also would have been mistakenly released early, but the error in his file was uncovered after he filed an appeal in his case. Clifton is serving 98 years in prison. Lima-Marin filed his own appeal in 2000 but, in a rare move, asked that it be dismissed less than a year later. Prosecutors say that showed he was aware of the clerical error before his release and feared any further court action would call attention to it. Rich Orman, an Arapahoe County senior deputy district attorney, said he was alerted to the error in January by a former prosecutor who handled Lima-Marin's case and was checking on its status. Orman quickly filed a motion to send Lima-Marin back to prison. A judge agreed. "He should go back because the law requires the sentence he received. This was a number of very serious criminal offenses, and anything less would be inappropriate," Orman said. "He should not be able to escape the minimum sentence due to a clerical error." Jacobson, with the state corrections department, said it was the court that made the mistake and prison officials would not have known Lima-Marin was released incorrectly. Colorado State Public Defender Doug Wilson did not return calls seeking comment. In April, a judge declined to release Lima-Marin at his public defender's request, noting that Lima-Marin knew he should have served 98 years but remained silent about the mistake. The Associated Press reached out to Lima-Marin for comment but he has not responded. "We don't have secrets. If he knew there was a mistake, he would have told me," Jasmine said. She said her husband did not try to mask his identity. The prospect of Lima-Marin remaining imprisoned for nine more decades has devastated his family. Jasmine said they are considering another appeal and have reached out to the attorney involved in the recent Missouri case. "He was given an opportunity to live again and it was taken away from him," Jasmine said.